Unlike other technologies, Zerona uses Low Level Laser Therapy (LLLT) to stimulate the body’s fat cells and create pores in the cells’ walls. Through these pores, the lipid material (i.e., the fat) is released, allowing the cell to collapse to a smaller size. Also unlike other technologies, the process does not kill or remove the fat cell. Believe it or not, the fat cell is not the enemy; it’s the size of the fat cell that is harmful to your health. In clinical trials, patients were treated 6 times over a 2 week period and lost on average 3.5 inches combined off their waist, hips and thighs. Some patients find that just 6 treatments fully address their goals while others need more treatments. Your body will continue to flush out the liberated fat and continues doing so for up to one week after your last treatment. You and your provider will discuss and design a plan that suits you best. This depends on how fast your lymphatic system can process the liberated fat. Age and lifestyle are a few items that may influence how fast you see results. In an ideal situation, patients should begin to notice a difference in how their clothes fit after their 4th treatment. To optimize results, we recommended that you drink 64 ounces of water per day and cut back on coffee, alcohol and soft drinks. It will also help improve results if you can get a small amount of lymphatic stimulation each day. You and your provider will discuss and design a plan that suits you best. Treatments are 40 minutes long which means you can easily fit them in to a busy schedule. During Zerona treatment, patients are asked to lie on a massage table, with the target area positioned directly under the lasers. A technician will position the device and adjust the four flex arms, which can conform to virtually any position, to most effectively target the desired trouble area. Treatments will last for 40 minutes, 20 minutes on each side. Treatments are recommended every other day, or within 72 hours of the last treatment. Clinical research has shown that using Zerona is safe and effective for removing inches of fat from the hips, waist, thighs and upper arms. Zerona is not a substitute for a healthy lifestyle and your provider will determine if treatment is right for you during a one-on-one consultation. Clinical research has proven that Zerona is safe and effective without supplements, diet or exercise. Doctors may recommend supplements and lymphatic stimulation to optimize your results but you do not have to adopt new diet or exercise habits. However, many patients feel more motivated to take care of themselves after the Zerona treatment. Zerona is the springboard that helps patients’ jumpstart their healthy lifestyle. 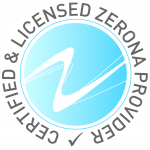 Zerona is FDA Cleared 510 (k) for the safe and effective circumferential reduction of the hips, waist, thighs and upper arms. You and your provider will discuss and design a plan that suits you best. Yes. The FDA labeled the Zerona safe and effective for removing inches of fat from patients’ hips, waist, thighs and upper arms.